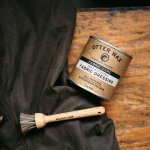 Heat-Activated Fabric Dressing comes in a large 1/2-pint tin and provides enough wax to tackle those bigger projects. This item is perfect for those folks looking to achieve that ‘Factory-Waxed’ appearance. Our Fabric Dressing is perfect for those waterproofing unwaxed items, but it’s also a great option for those that want to use an all-natural wax treatment to re-waterproof their factory-waxed and oiled jackets. Applies easily when melted with a natural-bristle paint brush, soft cloth, and some elbow grease. The application process contains a few more steps than the wax bars, but the extra effort yields fantastic results. Applying hot wax penetrates deep into fabrics and dramatically reduces cure time. 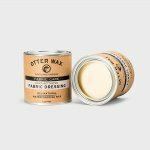 Fabric Wax and Fabric Dressing will work on most any type of fabric. 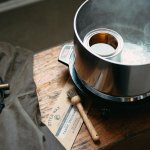 Because the wax is made from all-natural ingredients, it will generally bond best with natural fibers (cotton, hemp, etc. ), however it is also very effective on blended fabrics where the proportion of natural fiber to synthetic is in the majority.